Merger decisions are dramatically impacted by acquiring and targeted boards. Boards are elected by shareholders, many of whom lack the time or other resources to carefully scrutinize directors or issues to be voted upon at an annual meeting. Enter the Proxy Advisory Firms who make a business of issuing recommendations (and, pardon the conflict of interest, selling advisory services - but that is a point for another time). Today, I just want to talk about the influence of advisory firms. The influence of Proxy Advisory Firms is receiving renewed attention with the recent vote to separate the CEO and Chairman roles at JP Morgan. Jamie Dimon 'won' that vote in spite of negative recommendations from Institutional Shareholder Services and Glass Lewis. Let's examine the 'win' a bit closer and also examine an article in the Wall Street Journal today that suggests the influence of proxy advisory firms is on the decline. I'm not so sure that Dimon's results suggest any loss of influence of ISS or Glass Lewis. True, the proposal to split the roles received 33% support this year, down from 40% last year. But that is in the face of a massive campaign by JP Morgan to influence investors. In spite of the "London Whale" incident, Dimon is widely regarded as one of the most competent executives on Wall Street and it is clear that Morgan has benefitted under his leadership. I wouldn't expect firms or executives with lessor records to be able to sway votes. The chart below, taken from the WSJ article, suggests that an ISS recommendation is associated with a change in votes by about 15%. 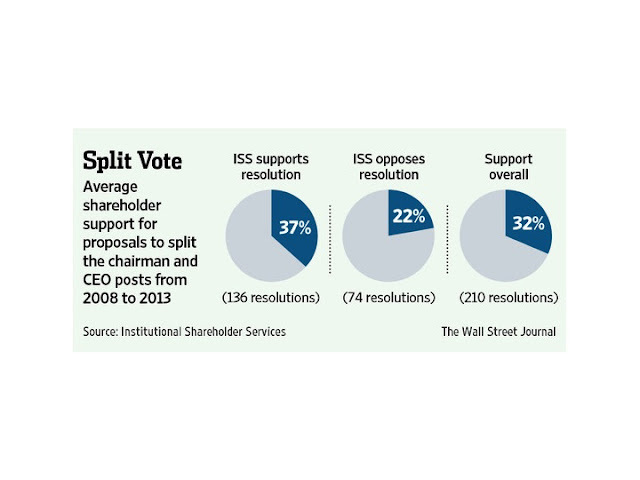 This simple chart doesn't indicate that the ISS recommendation swings votes by that much as factors that influence ISS also influence shareholders themselves. However, it is interesting to note that the 15% level is quite similar to our own analysis of over 2400 director elections. In that analysis we found that a negative recommendation by ISS moved votes by over 18% - after controlling for all of the other logical factors (firm performance, director performance, etc.). We'll discuss those results in a subsequent post. Here we also note that the three directors from the risk committee of JP Morgan received a negative recommendation from ISS and garnered less than 60% shareholder support. Those are very low numbers for directors. They typically receive over 90% support. The WSJ article can be downloaded here. More detail on our analysis of Board Elections will be found in a subsequent post.